In one of his earliest messages shortly after he arrived in 2009, David S. Guzick M.D., Ph.D., commented that the synergies of an integrated academic health center can only be fully realized if we work together. From those early days through a nine-year tenure that has left a legacy of unprecedented progress, Guzick worked to obilize faculty, staff and students to align the mission, vision, values and finances of our health colleges, research centers and institutes, and hospitals, while simultaneously drawing the academic health center even closer to the university as a whole. Our shared mission has always been to deliver high-quality, safe patient care; conduct innovative health science research; and educate health professionals while supporting community health. Guzick was a catalyst for a new unified approach to fuel this virtuous circle. He established integrated and cohesive governance of health affairs for UF and led the creation of new, unified strategic plans to guide decision-making. These cohesive five-year plans, with the inaugural “Forward Together” and then “The Power of Together,” and the metamorphosis of the organization from UF&Shands to UF Health, drove major accomplishments along the path that supported UF to become a Top 10 public university as he led us to move medicine forward. Over the nine years of his tenure as our executive leader, Guzick’s transformational leadership directed us through rapid and progressive change, with collaboration, teamwork and “unstoppable momentum” as guiding forces. He reinforced our passion: to put our patients and community at the center of all we do, and that Quality is Job 1. He took our approach to translating scientific discovery into clinical advances to another level. And he led us to start with the ideal patient experience as our goal and work from that to galvanize faculty, staff, residents, students and volunteers to see the academic health system as a symbiotic whole to inspire the work we do. We honor Dr. Guzick for his vision and leadership and look forward to seeing him around campus in his professorial bow tie as he continues to support our unstoppable momentum. The journey that led to David R. Nelson’s interim appointment as leader of UF Health began, in a sense, with a young man’s busted knee. Dartmouth College. Freshman year. Nelson intended to major in chemical engineering. But his real dream was soccer. He was good enough that he aspired to one day play for the U.S. Olympic team. But then he suffered a serious knee injury in a scrimmage. Suddenly, Nelson needed a new ambition. He knew he wouldn’t find it in chemistry, which, in truth, he hated. The student dean suggested Nelson just take a new class that looked interesting on a subject he had never before considered. Nelson’s career path has taken what he views as another unexpected turn with his recent appointment as the interim senior vice president for health affairs and president of UF Health, succeeding David S. Guzick, M.D., Ph.D., who stepped down July 1. Nelson had been serving as a professor in the UF College of Medicine and assistant vice president for research and director of the Clinical and Translational Science Institute, or CTSI. His medical career proved to be more successful and fulfilling than that youth with the dashed dreams could ever have imagined. Nelson, whose two sons were born at UF Health Shands Hospital, has spent 25 years working in UF’s academic health center. After earning his medical degree from SUNY Upstate University in Syracuse, N.Y., Nelson’s career at UF Health began with fellowship training in gastroenterology and hepatology. Nelson’s research has generated about $30 million in funding and he is the author of more than 200 publications. He isn’t going it alone. Nelson said Guzick has been a close mentor who, along with Michael L. Good, M.D., who recently stepped down as the dean of the UF College of Medicine, will be key resources he can still tap. Nelson said his new position is more than placeholder. One priority, for example, will be trying to speed the translation of research to improved patient care, an area where Nelson has experience as the leader of the CTSI. The goal is to shorten the average 17 years it takes to translate research findings into patient care advances. “We’re gathering both the health care and research groups together and we’ll be targeting areas where we think we can really capitalize and move the translation piece very quickly,” he said. Ed Jimenez, CEO of UF Health Shands Hospital, said that focus on translational research is one reason Nelson is well-positioned to lead UF Health. “Dr. Nelson will be a positive transitional leader,” Jimenez said. “He has focused much of his career on bringing discovery to the bedside and clearly understands the important link between science and patient care, something that is crucial for a robust academic health center. One request that Nelson made as he was offered his new role was that he continue to see patients in clinic once a week. “I’m always a doctor first. And I’ll never give that up,” he said. Nelson also has seen UF Health from the patient’s perspective. In fact, he’s been one. It’s another legacy of that wrecked knee — knee-replacement surgery, performed at UF Health Shands Hospital. I write to share news that later this fall, Danette and I will move to Salt Lake City, Utah, where I will join the faculty of the University of Utah as Senior Vice President for Health Sciences, Dean of the School of Medicine, and Chief Executive Officer of University of Utah Health. Transitions are bittersweet. The University of Florida and Gainesville have shaped our lives for over 34 years since we arrived here in the summer of 1984 to begin training in anesthesiology. We take so many wonderful memories with us. Our five children were born and raised in Gainesville, as was the Human Patient Simulator. We have had the opportunity to connect with so many gifted and compassionate individuals, working together every day to improve the lives of patients, students, communities and one another. The Human Patient Simulator could only have been born at the University of Florida. In the 1980s, I was given the unique opportunity to work with a team of engineers and physicians, who rallied together to design, build, test, refine, patent and license a lifelike learning form that enables meaningful experiential learning across the educational spectrum. Today, there are thousands of HPSs in use around the world, helping learners master a large array of basic and advanced professional skills. At the VA in the 1990s, we were early adopters of balanced quality scorecards to measure and improve patient care, smoothly rolled out the VA’s then-novel Computerized Patient Record System, and successfully competed for two national VA research center of excellence awards. During the past 10 years while serving as your dean, we have advanced excellence in each of our missions. Because of your tremendous compassion, skill and expertise, patients and their families drive by and fly over other health care providers to receive care from you at UF Health. Clinical growth has been robust, with ambulatory practice visits, hospital admissions, surgical procedures and emergency department visits all increasing 70 percent or more. Significant improvements have been achieved in quality of care and patient safety. Over the past decade, we have built and activated many new primary care offices, multispecialty care centers, freestanding emergency rooms and hospital bed towers. Our second Springhill facility will open its doors next month; new clinical space at the Oaks Mall and a new facility for Movement Disorders are coming in 2019. Our research and education programs have seen similar advances, with NIH research funding awards to college faculty increasing from $61 million to $102 million (+67 percent) annually, and total extramural grant support now approaching $250 million. The UF medical education curriculum has been modernized, and a new, state-of-the-art medical education facility, the George T. Harrell, M.D., Medical Education Building, built with the generous philanthropic support of our college alumni and friends. Medical student outcomes are strong, with nearly 30 percent of UF medical student graduates placing into residency training programs associated with top 10 medical schools. Initiatives to advance the diversity of the student body have been successful. I have had the privilege of signing a historic number of diplomas and certificates, including over 1,300 medical degrees, 600 physician assistant degrees, 300 graduate degrees and 2,000 resident and fellowship certificates. Each represents a unique individual, now Gator alumnus, providing much-needed health care and scientific research in our state and nation. Our college faculty family now numbers over 1,400 strong. Twenty-five department chairs have been recruited and appointed over the past decade, and three of our department chairs are now deans at U.S. medical schools. I was honored to work with Florida legislators on many issues, including increased funding to the UF medical school, and to lead statewide efforts to assure Medicaid patients had access to high-quality specialty care. Together in 2016, we celebrated the 60th anniversary of the founding of the UF College of Medicine and memorialized our impressive legacy of innovation and collaboration in a commemorative history book (https://alumni.med.ufl.edu/60thbook/). I now look forward to using that volume to help me remember all the wonderful people who have blessed our lives and the many shared experiences of the past three-and-a-half decades. I know this announcement comes at a time when many of you are concerned about the path forward, as decisions now need to be made about two pivotal senior leadership roles. Together we have accomplished so much. Yet I am truly confident you will achieve even more in the months and years ahead. Our shared values and vision — hardwired into who we are here at UF Health — will endure and will propel this fine academic health center forward anew. The momentum you’ve built will continue because of your lasting commitment to our patients, our students and each other, and because this great university, which recognizes the importance of our missions and respects what we’ve collectively accomplished, will ensure it does. For each of us, the path of life takes many twists and turns, some anticipated, some not. It is always difficult to select a new trail when the current one has been so reliable and fulfilling. But personal and professional growth are often found on new trails, and so from time to time, it is important to avail oneself of a new opportunity. As we embark on our new journey to the west, we take with us our many Florida friendships, and fond memories of the special people that make the University of Florida a very special place. There is much we will miss, but never forget. Adrian Tyndall, M.D., a 12-year veteran of the University of Florida faculty, a professor and chair of emergency medicine at the UF College of Medicine, has been named interim dean of the college. “I look forward to working with our exceptional group of department chairs and leaders at the College of Medicine and UF Health Shands to ensure that our faculty, students and staff are supported in their work to help improve the health of our patients and communities,” said Tyndall, M.P.H., FACEP, FAAEM, who is also the physician-in-chief of emergency services for UF Health. David R. Nelson, M.D., interim senior vice president for health affairs at UF and president of UF Health, made the appointment after consulting with key leaders, faculty members and UF President Kent Fuchs. “Dr. Tyndall has demonstrated outstanding leadership in his tenure here at the university’s academic health center." Tyndall joined the UF faculty in 2006. Two years later, he became chair of the department of emergency medicine, which includes the UF Health Shands E.R. and Level I Trauma Center, the UF Health Shands Children’s Hospital’s Pediatric E.R. and two freestanding emergency centers, located in northwest and southwest Gainesville. In his position, he oversees 53 faculty members and fellows, one of the largest destination emergency medicine residency training programs in the state of Florida, and the care involving more than 120,000 emergency patient visits annually. Tyndall completed his undergraduate studies at the George Washington University with concentrations in chemistry, music and zoology. He is a graduate of the University of Maryland School of Medicine and completed his residency in emergency medicine at the University of Maryland Medical Center and the R Adam Cowley Shock Trauma Center. In addition, he received his master’s degree in health services management and health policy from Columbia University in New York. He has served on the board of directors of UF Health Shands for four consecutive terms and has been a longstanding elected member of the UF Health Shands Medical Executive Committee. He serves on the board of directors and is the president-elect of the Florida College of Emergency Physicians. He is a member-at-large of the board of trustees of the Society for Academic Emergency Medicine Foundation. He was also named a 2018-2019 fellow of the Council of Deans of the Association of American Medical Colleges. Tyndall has held faculty appointments at the Weill Medical College of Cornell University and at the State University of New York Health Sciences Center in Brooklyn and was a residency program director in emergency medicine before moving to Florida. Tyndall has been married to his wife, Johanne, an attorney, for 21 years and has raised three daughters in Gainesville. He is an occasional aspiring pianist and bicyclist in his spare time. UF Health neurosurgeon Brian L. Hoh, M.D., an internationally known expert in the treatment of brain aneurysms, brain arteriovenous malformations, and ischemic and hemorrhagic stroke, became chair of the Lillian S. Wells Department of Neurosurgery in the University of Florida College of Medicine on July 1. He succeeded longtime chair and neurosurgical pioneer William A. Friedman, M.D., who will continue on as a practicing neurosurgeon and faculty member. Trained and educated at Stanford University, Columbia University and Harvard University, Hoh is only the third chair in the four-decade history of the department, following two giants in the field: Friedman, a pioneer in the early development of a now commonly used noninvasive neurosurgical treatment called stereotactic radiosurgery, and before him, the late Albert L. Rhoton Jr., M.D., considered the father of neurosurgical anatomy and microneurosurgery, a technique involving microscopes and microsurgical instruments Rhoton designed for maximum precision that are now used worldwide. When Hoh joined UF in 2006 after completing neurosurgery training and a fellowship in interventional neuroradiology at Massachusetts General Hospital of Harvard University, UF Health Shands Hospital treated only 150 stroke patients a year and didn’t have a stroke center. Hoh recruited a team of stroke neurologists and cerebrovascular/endovascular neurosurgeons to build what is now the UF Health Shands Comprehensive Stroke Center — certified by The Joint Commission — which treats about 1,000 patients a year from across the Southeast. Hoh is a National Institutes of Health R01-funded principal investigator who studies the biological mechanisms of brain aneurysm formation and rupture and how to use tissue engineering technology to improve aneurysm treatment. An award-winning teacher, Hoh has served as UF’s neurosurgery residency program director, one of the best of its kind in the U.S. He established and served as director of UF’s fellowship in endovascular surgical neuroradiology, one of only two in the U.S accredited by the Accreditation Council for Graduate Medical Education. As chief of the division of cerebrovascular surgery, Hoh oversees a team that treats ischemic and hemorrhagic stroke, brain aneurysms, AVMs, carotid and intracranial atherosclerosis, cavernous malformations and moyamoya disease. 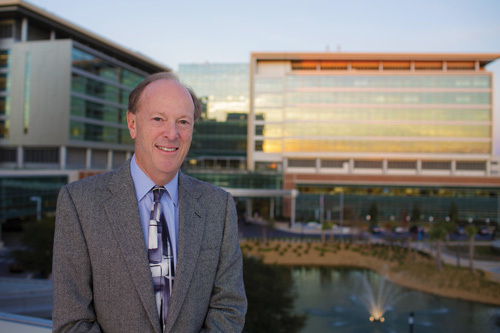 David S. Guzick, M.D., Ph.D., who stepped down in July as the senior vice president for health affairs at UF and president of UF Health, said the department of neurosurgery has played a vital role in the academic health center’s rise in stature. “Dr. Hoh’s knowledge and expertise will allow UF Health to successfully build on a foundation of excellence in providing premier care to patients suffering from brain disorders and to make scientific discoveries that will improve treatments for residents in the Southeast and beyond,” Guzick said. — Brian L. Hoh, M.D. Among Hoh’s goals is to launch an interdisciplinary Comprehensive Spine Center for patients with back or neck pain. He also envisions continued growth in the Preston A. Wells Jr. Center for Brain Tumor Therapy and UF Brain Tumor Immunotherapy Program led by Duane Mitchell, M.D., Ph.D., which attracts patients with brain tumors from across the country and the world to participate in clinical trials. Additionally, Hoh foresees continued excellence from the Fixel Center for Neurological Diseases at UF Health — an interdisciplinary center combining the expertise of neurosurgery, neurology, psychiatry, physical therapy, occupational therapy, social work, nutrition and speech pathology under one roof that is a leader in the treatment and research of Parkinson’s and other neurological and psychiatric diseases. In the future, Hoh eyes the creation of a multidisciplinary stroke research center that will unite expert scientists and clinicians who will collaborate on basic science and translational and clinical research projects to create novel therapies and conduct first-in-human clinical trials for patients with ischemic and hemorrhagic stroke. These types of programs draw international attention to UF’s Evelyn F. and William L. McKnight Brain Institute, or MBI, which supports the immunotherapy program, the department of neurosurgery and research programs in age-related memory loss, neurodegenerative disorders, addiction and brain and spinal cord injury.